¡Adios Calavera! * is a small box two-player abstract board game being released at the Essen Spieltage in October 2017. The game has several variants, but the 8+ age range on the box is certainly achievable: while younger children will be able to play the simplest version. The game is themed around the Mexican harvest celebration, the Day of the Dead, where families and friends celebrate their lost loved ones and help see them off on their spiritual journey. What it comes down to is a race to move your pieces from one side of the board to the other in an experience that could be described as draughts on steroids. In the box you’ll find a nicely illustrated board, two player references and 16 wooden player pieces (with stickers to put on both sides of each). The components are all of solid quality (the board could be a little thicker) and I really like the artwork. A game takes less than 30 minutes and the price tag is around £20. There are also several mini expansions available to add variety. I’ve reviewed them all in a single post here. Despite having so few pieces there are several ways to play Adios Calavera which actually do compliment each other, rather than being a fudged way to not decide which is the best version. In its super simplest version (which most players will skip past and ignore), each player has eight identical pieces which they need to move across a roughly 9×9 grid to win: but one player is moving north to south, the other east to west (rather than sitting opposite each other, as is traditional in this kind of game). Players take it in turns to move any one of their pieces. You can move in any combination of orthogonal directions, with the amount of moves you get being (up to or) equal to the amount of other pieces (from either side) in your row – with your ‘row’ direction being that which your pieces need to move across the board. You can’t move through, only around, other pieces (yours or your opponent’s) and several spaces (including the centre space) being marked as obstacles. First player to get all their pieces across the board wins (if you complete on the same turn, it’s a draw). While I’m sure this straight forward version will be enough for some, flipping each piece over reveals their special power: essentially turning them from draughts into chess pieces. While you can play with all eight powers (each player has an identical set), the standard way to play is by using four of them each – and there are a variety of ways to determine which to use (random; flip two, keep one – my favourite; straight choice etc). Those with powers you don’t use stay as standard pieces for that game. The eight special powers are all straight forward: move faster, move diagonal, jump pieces, push/pull pieces etc. Some are straightforward, some situational, but all can be super effective if used by a skilled player (trust me, I’ve been beaten by good plays of most of them!). And the same end game rules apply – the first player to get all their pieces across the board wins. The writer: Adios Calavera’s charming art style drew me in, but once it arrived the simplistic rule set didn’t inspire confidence. however, once we started playing I was immediately intrigued by the tough decisions and depth of game play. Every move needs to consider the impact on both players’ movement capabilities, as well as thoughts of blocking the other player’s path across the board. And the fact you mix up the combos you use each game ensures extra replayability. The thinker: There is an awful lot to be commended here. The limit of four powers per player, and many ways to decide them, will stop this becoming a chess-like game that can be ‘solved’. While of course players playing often will find certain combos that work well together, you will still have to contend with whatever combo you opponent plays – and this already large set of variables is exacerbated by the fact you can set up your eight pieces in any formation you choose across your eight starting spaces. 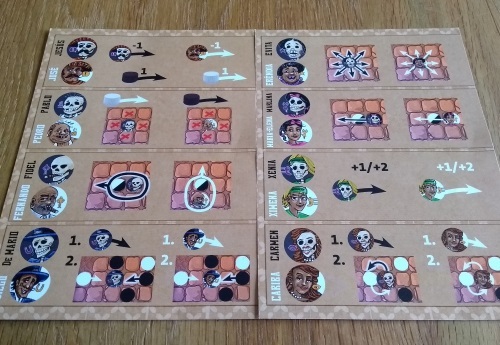 The trasher: My favourite thing about Adios Calavera is how differently each piece works – with some working well as both attacking or defending pieces. Some may see the strong man as simply awesome for pushing your own pieces across the board – but get him in front of your opponent’s pieces and he can push them backwards too. And the magnet is great for shunting your own pieces into better rows – and equally awesome at moving your opponent’s into weaker ones. The dabbler: Pretty to look at, and simple and fast to play? count me in! While the theme could be anything they’ve done a great job of it: the artwork is playful and the characters all have names and nicely thematic descriptions: from ‘Pedro the Unclean’ who’s cheesy smell means your opponent can’t place pieces next to him, to the exuberant Carmen who embraces another piece and whirls them around (essentially swapping places with them). An instant favourite. As this is a rare occasion where I’ve received a pre-release copy and am actually the first I can find that has reviewed it, it’s hard to feed off the criticisms and misgivings of others – which is made harder by the fact I can’t find much at fault with the game. As time passes, I’ll be happy to address any concerns here (or feel free to ask questions as comments below). But while i’m a big fan of the game I recognise that it is, at heart, a simple and elegant two-player abstract game with no luck involved. As good as I may think it is, if you’re not into this kind of game I doubt there is anything here that will convert you – although the variable setup and powers do at least lessen the impact of one player being far more experienced than the other. 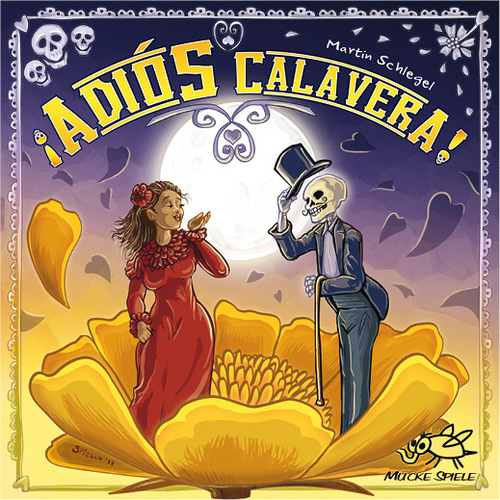 Adios Calavera is the best new abstract board game I’ve played in several years. It has a small footprint and low price tag, while managing to be charming, varied and thinky – and can be played in about 15 minutes with very little setup and pack down. Highly recommended for any gamer and a definite keeper for me, joining a very small set of abstracts that have hung around on my gaming shelves. * I would like to thank Mücke Spiele for providing a copy of the game for review. I loved my first play of this game and will definitely be picking it up once available. Great review.